Last week I was in Sydney supporting a Tony Robbins event called Unleash The Power Within(UPW). If you are someone who regularly follows my stuff, you will know that I am a big fan of Tony Robbins’ work. Beyond the man himself, simply being in that environment is spectacular for my soul. In fact, it is one of the highest vibrational environments I have ever had the pleasure of being in. There is a magical vortex of energy at these UPW events – it’s a place where people literally transform in front of me. It is such a privilege to watch it all unfurl and is a great reminder of the power of doing inner work (I have seen peoples’ faces physically change over the course of a UPW event). In fact, one of the ladies on our Crew Team at this event had an “intervention” with Tony last year. When this woman stood up and spoke at the previous event she felt totally depressed and completely hopeless. She couldn’t see any light in her life, and had set herself up in a way in which it was always going to be full of suffering and bleakness. So, to see her walk into our Crew Room on Day One of this event as a bright, bubbly, and carefree woman was nothing short of incredible! I thoroughly enjoyed hearing about her journey and all the amazing changes she had created in her life over the past 15 months. She is a true testament to the fact that if we are willing to get uncomfortable, make some changes, step up, and be 100% responsible for our life, then anythingis possible. 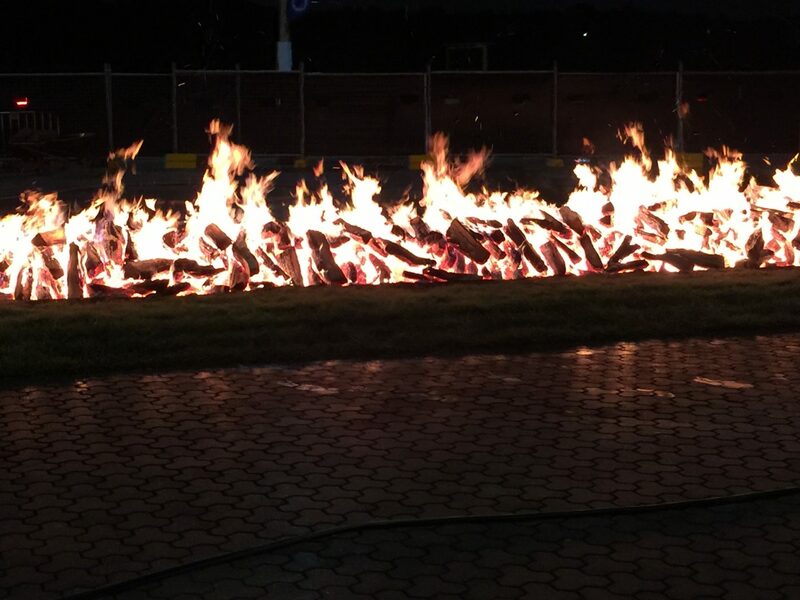 On the first night of UPW, the participants are invited to do a “Firewalk”. The Firewalk is a metaphor for what we are actually capable of in life if we focus, believe, and back ourselves in. It gives participants a real-life illustration of what they can do, so it’s an example they can take away and access whenever they need to in the future for inspiration. Being evidence-based-creatures, we humans need to continuously create and find evidence that supports us in achieving what we want. If we don’t do this, then we tend to find evidence that supports why we can’t have what we want, which just gets so tiresome and boring, believe me. The Firewalk involves walking across several metres of hot coals. I’m talking burning, red, hot, fiery coals. There is a dedicated team of crew (the “Fire Team”) who spend the whole day burning tons of wood to produce enough hot coals to set up 24 Lanes of Fire. It is an almighty sight! There are hundreds of us Crew Members dressed in black, all of us having different roles in each Lane of Fire; as well as two Fire Team members for each lane. The Fire Team members have a wheelbarrow full of burning hot coals, their job being to keep shoveling coals onto the lanes so that they’re ready for the participants. There we all are, us Crew Members – prepped and waiting for everyone – and then when Tony makes the call, out they all come!!! Out of 7000 participants, just under 4000 ended up walking over the Lane of Fire. For those of you doubters I promise there were absolutely zero third degree burns! No charred stumps! Not one screaming burn victim clogging up the Emergency Department! This is because Tony works with the crowd prior to the Firewalk to get them in “state”. What “state” means is that they are completely focused on the outcome; they are managing their thoughts; and most importantly – they are backing themselves. They are in the proper “state” to be able to walk across hot coals without burning themselves. Astounding. Imagine how much could be achieved each day if we all walked around backing ourselves to that level!!! It was another brilliant event and I am returning home with a full heart and tons of new memories, friends, and even more evidence that we really are capable of things that seem impossible.